2003-06-11 Assigned to ADVANCED CARDIOVASCULAR SYSTEMS, INC. reassignment ADVANCED CARDIOVASCULAR SYSTEMS, INC. ASSIGNMENT OF ASSIGNORS INTEREST (SEE DOCUMENT FOR DETAILS). Assignors: HOSSAINY, SYED F.A., PACETTI, STEPHEN D.
Some invention embodiments are block copolymers of one or more diols, triols, or polyols with a toxicologically acceptable acid monomer (polycarboxylic acid) such as the following: C 2 to C12 straight chain, aliphatic diacids, specifically oxalic acid, malonic acid, succinic acid, glutaric acid, adipic acid, pimelic acid, suberic acid, azaleic acid, and sebacic acid. Longer chain lengths, such as found in dodecandioic acid, tetradecandioic acid, and hexadecandioic acid, are also possible. Polycarboxylic acids include citric acid and tartaric acid. Unsaturated polycarboxylic acids include fumaric acid and muconic acid. Lastly, useful aromatic polycarboxylic acids include terephthalic acid, isophthalic acid, phthalic acid, 1,6-bis(p-carboxy phenoxy)hexane, 1,3-bis(p-phenoxy carboxy)propane, and 1,4-bis(p-phenoxy carboxy)butane. In some invention embodiments, the toxicologically acceptable polycarboxylic acid monomer specifically excludes sebacic acid. Some invention block copolymers can be represented by the following formula: [AB] n[A′B′]m. In this formula A represents a moiety derived from an aliphatic diol, triol, or polyol. B represents a moiety derived from a polycarboxylic acid. In some embodiments these are limited to a toxicologically acceptable polycarboxylic acid monomer; in these or other embodiments, polycarboxylic acid monomers are selected from those specifically disclosed above. A′ represents a moiety derived from an aliphatic diol, triol, or polyol that is the same as or different from A. And B′ represents a moiety derived from a polycarboxylic acid that is the same as or different from B. n and m represent the relative length of each block in this block copolymer. For purposes of this disclosure we define the soft block as having lower T g or being highly water swellable. In some embodiments, the block labeled “n” contains the BB moiety and is, therefore the soft segment or soft block because most biobeneficial moieties are hydrophilic and absorb water. The other block, labeled by “m”, is referred to as the hard segment. For purposes of this disclosure, we define the hard blocks as the blocks with a lower water absorption or a higher Tg. In the above formulas, a —CH 2— group can be substituted with a —Si(OR)2— group in which R is an alkyl, phenyl, or halogenated alkyl containing 1-6 carbon atoms. A —CH2— group can be substituted with a keto group, C═O. And sulfur can be substituted for oxygen, thereby converting ether linkages into sulfide linkages. Suitable polyols are ethylene glycol, 1,2-propane diol, 1,3-propane diol, 1,4-butanediol, 1,5-butanediol, 1,6-hexanediol, 1,7-heptanediol, 1,8-octanediol, higher diols up to C 16, glycerol, trimethylol propane, pentaerythritol, cyclohexanedimethanol, serinol, diethanolamine, and saccharides such as erythrose, threose, ribose, arabinose, xylose, lyxose, dihydroxyacetone, erythrulose, xylulose, aldoses, and ketoses. In some embodiments, polyols are 1,2-propanediol, 1,3-propanediol, 1,4-butanediol, 1,6-hexanediol, 1,10-decanediol, 1,12-dodecanediol, glycerol, serinol, diethanolamine, trimethylol propane, or pentaerythritol. The polycarboxylic acid is a compound with at least two carboxylic acid groups. For implant use, polycarboxylic acid used in this invention should be toxicologically acceptable. This means the toxicity it imparts to the polymer, and the toxicity of the monomer itself when released, should be low enough that the polymer can be used within a mammalian body. Specific examples of these include C 2 to C12 straight chain aliphatic diacids, specifically oxalic acid, malonic acid, succinic acid, glutaric acid, adipic acid, pimelic acid, suberic acid, azaleic acid, sebacic acid, and citramalic acid. Longer chain lengths, such as found in dodecanedioic acid, tetradecanedioic acid, and hexadecanedioic acid, are useful in the practice of this invention. Polycarboxylic acids include citric acid, tricarballylic acid, and tartaric acid. Unsaturated polycarboxylic acids include fumaric acid and muconic acid. Lastly, useful aromatic polycarboxylic acids include terephthalic acid, isophthalic acid, phthalic acid, 1,6-bis(p-carboxy phenoxy)hexane, 1,3-bis(p-phenoxy carboxy)propane, and 1,4-bis(p-phenoxy carboxy)butane. Conventional therapeutic agents, such as small-hydrophobic drugs, may also be added to invention copolymers, making them bioabsorbable, drug-eluting systems. Conventional therapeutic agents can be grafted on to the invention copolymers or can be mixed in the invention copolymers. Invention copolymers can be coated as blends with a variety of other biobeneficial polymers. Moreover, they can serve as base or topcoat layers for other biobeneficial polymer layers. The therapeutic agent can be for inhibiting the activity of vascular smooth muscle cells. More specifically, the therapeutic agent can be aimed at inhibiting abnormal or inappropriate migration or proliferation of smooth muscle cells to prevent, inhibit, reduce, or treat restenosis. The therapeutic agent can also include active agent may be any substance capable of exerting a therapeutic or prophylactic effect in the practice of the present invention. Examples of such active agents include antiproliferative, antineoplastic, antiinflammatory, antiplatelet, anticoagulant, antifibrin, antithrombin, antimitotic, antibiotic, and antioxidant substances as well as combinations thereof. An example of an antiproliferative substance is actinomycin D, or derivatives and analogs thereof (manufactured by Sigma-Aldrich 1001 West Saint Paul Avenue, Milwaukee, Wis. 53233; or COSMEGEN available from Merck). Synonyms of actinomycin D include dactinomycin, actinomycin IV, actinomycin I 1, actinomycin X1, and actinomycin C1. Examples of antineoplastics include paclitaxel and docetaxel. Examples of antiplatelets, anticoagulants, antifibrins, and antithrombins include aspirin, sodium heparin, low molecular weight heparin, hirudin, argatroban, forskolin, vapiprost, prostacyclin and prostacyclin analogs, dextran, D-phe-pro-arg-chloromethylketone (synthetic antithrombin), dipyridamole, glycoprotein IIb/IIIa platelet membrane receptor antagonist, recombinant hirudin, thrombin inhibitor (available from Biogen), and 7E-3B® (an antiplatelet drug from Centocor). Examples of antimitotic agents include methotrexate, azathioprine, vincristine, vinblastine, fluorouracil, adriamycin, and mutamycin. Examples of cytostatic or antiproliferative agents include angiopeptin (a somatostatin analog from Ibsen), angiotensin converting enzyme inhibitors such as CAPTOPRIL (available from Squibb), CILAZAPRIL (available from Hoffman-LaRoche), or LISINOPRIL (available from Merck & Co., Whitehouse Station, N.J.), calcium channel blockers (such as Nifedipine), colchicine, fibroblast growth factor (FGF) antagonists, histamine antagonist, LOVASTATIN (an inhibitor of HMG-CoA reductase, a cholesterol lowering drug from Merck & Co.), monoclonal antibodies (such as PDGF receptors), nitroprusside, phosphodiesterase inhibitors, prostaglandin inhibitor (available form Glazo), Seramin (a PDGF antagonist), serotonin blockers, thioprotease inhibitors, triazolopyrimidine (a PDGF antagonist), and nitric oxide. Other therapeutic substances or agents that may be appropriate include alpha-interferon, genetically engineered epithelial cells, dexamethasone, estradiol, clobetasol propionate, cisplatin, insulin sensitizers, receptor tyrosine kinase inhibitors and carboplatin. Exposure of the composition to the active agent should not adversely alter the active agent's composition or characteristic. Accordingly, the particular active agent is selected for compatibility with the blended composition. Rapamycin is a suitable active agent. Additionally, 40-O-(2-hydroxy)ethyl-rapamycin, or a functional analog or structural derivative thereof, is suitable, as well. Examples of analogs or derivatives of 40-O-(2-hydroxy)ethyl-rapamycin include but are not limited to 40-O-(3-hydroxy)propyl-rapamycin and 40-O-[2-(2-hydroxy)ethoxy]ethyl-rapamycin. The release rate active agents, such as 40-O-(2-hydroxy)ethyl-rapamycin, can be advantageously controlled by various methods and coatings as is known in the art. g) BB represents a biobeneficial moiety. c) a biobeneficial moiety having biobeneficial characteristics, a non-fouling moiety having non-fouling characteristics, a bioactive moiety having bioactive characteristics, or a moiety that has any combination of biobeneficial, non-fouling, or bioactive characteristics. 5. The polymer of claim 2 wherein the alcoholic moiety is derived from at least one of ethylene glycol, 1,2-propane diol, 1,3-propane diol, 1,4-butanediol, 1,5-butanediol, 1,6-hexanediol, 1,7-heptanediol, 1,8-octanediol, higher diols up to C16, glycerol, trimethylol propane, pentaerythritol, cyclohexanedimethanol, serinol, diethanolamine, or saccharides. 6. The polymer of claim 5 wherein saccharides are selected from erythrose, threose, ribose, arabinose, xylose, lyxose, dihydroxyacetone, erythrulose, xylulose, aldoses, or ketoses. 7. The polymer of claim 6 comprising at least three alcoholic moieties derived from an aliphatic diol, triol, or polyol. 8. The polymer of claim 2 wherein the acidic moiety is derived from at least one of straight chain aliphatic diacids having 2 to 20 carbon atoms. 9. The polymer of claim 2 wherein the acidic moiety is derived from at least one of oxalic acid, malonic acid, succinic acid, glutaric acid, adipic acid, pimelic acid, suberic acid, azaleic acid, sebacic acid, terephthalic acid, malic acid, fumaric acid, citric acid, citramalic acid, tricarballylic acid, tartaric acid, isophthalic acid, phthalic acid, 1,6-bis(p-carboxy phenoxy)hexane, 1,3-bis(p-phenoxy carboxy)propane, 1,4-bis(p-phenoxy carboxy)butane, dodecanedioic acid, tetradecanedioic acid, hexadecanedioic acid, or oligomeric diacids with anhydride bonds in the backbone. 10. The polymer of claim 9 wherein oligomeric diacids with anhydride bonds in the backbone are selected from poly(sebacic anhydride), poly(suberic anhydride), poly(adipic anhydride), poly(succinic anhydride), poly(maleic anhydride), poly(1,6-bis(p-phenoxy carboxy)hexane), poly(1,4-bis(p-phenoxy carboxy)butane), poly(1,3-bis(p-phenoxy carboxy)propane), and poly(1,4-dicarboxybenzene). 11. The polymer of claim 9 comprising at least two acidic moieties each derived from a different polycarboxylic acid. 12. The polymer of claim 2 wherein the biobeneficial moiety, the non-fouling moiety, or the bioactive moiety are selected such that they give rise to a released molecule that can pass through a mammalian kidney. 13. The polymer of claim 12 wherein the biobeneficial moiety, the non-fouling moiety, or the bioactive moiety are selected such that the released molecule has a molecular weight of less than or equal to 40,000 daltons. 14. The polymer of claim 2 wherein the biobeneficial moiety is at least one of the polyethylene glycol, polypropylene glycol, block polymer surfactants of polyethylene glycol and polypropylene glycol, hydroxy functional poly(vinyl pyrrolidone), dextran, dextrin, sodium hyaluronate, heparin, elastin, chitosan, water-soluble derivatives of heparin, water-soluble derivatives of elastin, water-soluble derivatives of chitosan, tropoelastin, Albumin, poly(2-hydroxyethyl methacrylate), heparin, hirudin, or sulfonated polystyrene. wherein L represents a cross-linking group or hydrogen. wherein at least one of the first- or second-block alcoholic moieties or first- or second-block acidic moieties is or attaches to a biobeneficial moiety. b) a third-block acidic moiety derived from a di-, tri-, or poly-acidic carboxylic acid. 20. The copolymer of claim 18 wherein the first- and the second-block alcoholic constituents are independently derived from 1-to-50-carbon-atom molecules. 21. The copolymer of claim 20 wherein the first- and the second-block alcoholic moieties are independently derived from 1-to-10-carbon-atom molecules. 22. The copolymer of claim 18 wherein first- and second-block alcoholic moieties are independently derived from at least one of ethylene glycol, 1,2-propane diol, 1,3-propane diol, 1,4-butanediol, 1,5-butanediol, 1,6-hexanediol, 1,7-heptanediol, 1,8-octanediol, higher diols up to C16, glycerol, trimethylol propane, pentaerythritol, cyclohexanedimethanol, serinol, diethanolamine, or saccharides. 23. The copolymer of claim 22 wherein saccharides are selected from erythrose, threose, ribose, arabinose, xylose, lyxose, dihydroxyacetone, erythrulose, xylulose, aldoses, or ketoses. 24. The copolymer of claim 18 wherein the first- and second-block acidic moieties are independently derived from 1-to-50-carbon-atom molecules. 25. The copolymer of claim 24 wherein the first- and the second-block acidic moieties are independently derived from 1-to-10-carbon-atom molecules. 26. The copolymer of claim 18 wherein the first- and the second-block acidic moieties are independently derived from at least one of oxalic acid, malonic acid, succinic acid, glutaric acid, adipic acid, pimelic acid, suberic acid, azaleic acid, sebacic acid, terephthalic acid, malic acid, fumaric acid, citric acid, citramalic acid, tricarballylic acid, tartaric acid, isophthalic acid, phthalic acid, 1,6-bis(p-carboxy phenoxy)hexane, 1,3-bis(p-phenoxy carboxy)propane, 1,4-bis(p-phenoxy carboxy)butane, dodecanedioic acid, tetradecanedioic acid, hexadecanedioic acid, or oligomeric diacids with anhydride bonds in the backbone. 27. 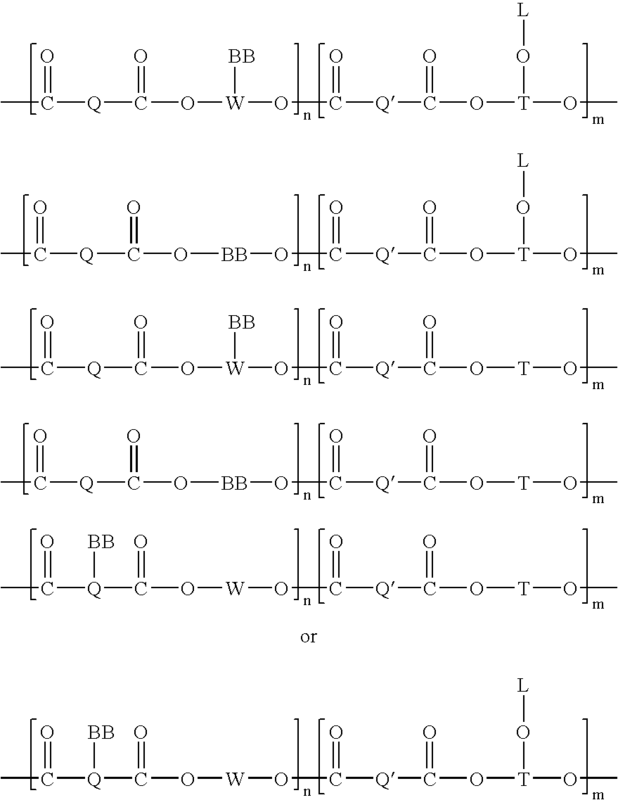 The copolymer of claim 26 wherein oligomeric diacids with anhydride bonds in the backbone are selected from poly(sebacic anhydride), poly(suberic anhydride), poly(adipic anhydride), poly(succinic anhydride), poly(maleic anhydride), poly(1,6-bis(p-phenoxy carboxy)hexane), poly(1,4-bis(p-phenoxy carboxy)butane), poly(1,3-bis(p-phenoxy carboxy)propane), and poly(1,4-dicarboxybenzene). 28. The copolymer of claim 18 wherein the biobeneficial molecule is selected from molecules that impart the characteristic of being biobeneficial. 29. The copolymer of claim 28 wherein the biobeneficial molecule is at least one of the polyethylene glycol, polypropylene glycol, block copolymer surfactants of polyethylene glycol and polypropylene glycol, hydroxy functional poly(vinyl pyrrolidone), dextran, dextrin, sodium hyaluronate, heparin, elastin, chitosan, water-soluble derivatives of heparin, water-soluble derivatives of elastin, water-soluble derivatives of chitosan, tropoelastin, Albumin, poly(2-hydroxyethyl methacrylate), heparin, hirudin, or sulfonated polystyrene. c) then polymerizing a mixture of a polycarboxylic acid based on Q′, a di-, tri-, or polyol based on T, and the product of b). 31. The method of claim 30 wherein preparing a polymerizable biobeneficial moiety based on BB comprises connecting a biobeneficial moiety, BB, to a di-, tri-, or poly-ol based on W.
b) then copolymerizing a polycarboxylic acid based on Q′, a di-, tri-, or polyol based on W and the product of a). 33. A medical device comprising the polymer claim 2. 34. A medical device comprising the polymer claim 3. 35. A medical device comprising the polymer claim 12. 36. A medical device comprising the polymer claim 18. 37. A composition comprising a first polymer blended with the polymer of claim 2. 38. The composition of claim 38 wherein the first polymer modulates biological outcome. 39. 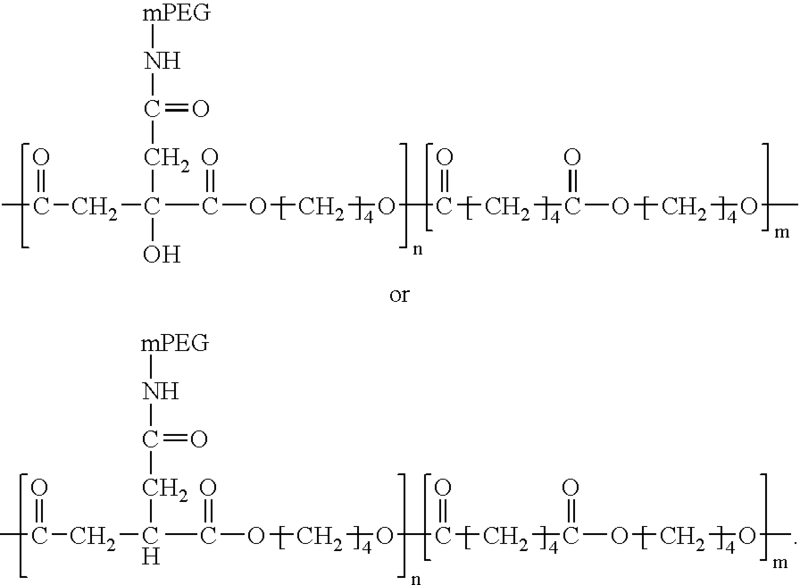 The composition of claim 37 wherein the first polymer comprises polycaprolactone, poly(D,L-lactide), poly(L-lactide), poly(D,L-lactide-co-L-lactide), poly(glycolide), poly(D,L-lactide-co-glycolide), poly(dioxanone), poly(4-hydroxybutyrate), poly(3-hydroxybutyrate), poly(3-hydroxy valerate), poly(hydroxybutyrate-co-hydroxyvalerate), poly(tyrosine derive carbonates), poly(tyrosine arylates), poly(imino carbonates), poly(trimethylene carbonate), poly(anhydrides), poly(orthoesters), or poly(ester amides). 40. The composition of claim 38 wherein the first polymer comprises polycaprolactone, poly(D,L-lactide), poly(L-lactide), poly(D,L-lactide-co-L-lactide), poly(glycolide), poly(D,L-lactide-co-glycolide), poly(dioxanone), poly(4-hydroxybutyrate), poly(3-hydroxybutyrate), poly(3-hydroxy valerate), poly(hydroxybutyrate-co-hydroxyvalerate), poly(tyrosine derive carbonates), poly(tyrosine arylates), poly(imino carbonates), poly(trimethylene carbonate), poly(anhydrides), poly(orthoesters), or poly(ester amides).